The timeline view gives you a snapshot of the major stories for each day, and you can drag the dates across to go back in time. It seems to favor Time Magazineand Wikipedia Events, although you can get rid of those results with a click. If you want to zero in on a particular topic, you can search for that term to see how a story has evolved over time. The timeline remembers your searches and saves them if you are logged in. You can also switch the calendar to view stories by day, week, month, year, or decade. But why not by the hour or the minute? That is where Google news is weakest and losing out to Twitter search, in my opinion. Finally, to put a finer filter on it, you can search only news quotes, news videos, blogs, magazines, newspapers, Wikipedia, or various other sources. Maybe it could add a bias filter. The idea is a good one, but this is very obviously a Google Labs project. Switching from year to decade, back to day is not seamless.Going from decade to day, for instance, doesn’t bring me back to the present, but to 2003. Similarly, it seems like it has trouble switching from search term to search term. This might be simply because it just launched, but I am hoping Google resolves these issues quickly so I can test it as a research tool. I often find myself looking for articles from the past, and seeing stories laid out on an actual timeline is visually helpful. It would also be nice if you could merge different sources, so that you could search across blogs and news at the same time, for instance. 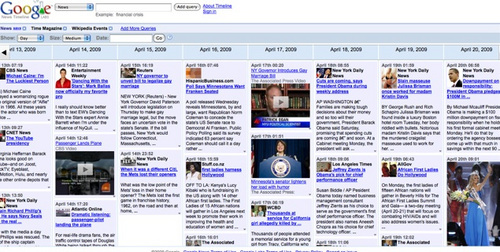 Via：Google News Timeline Offers A New Way To Search The Past.